A significant extension and complete rethink of the internal layout results in a detached bungalow that is spacious, bright and airy yet instantly homely and charming. It offers a generous open plan lounge/kitchen/diner with patio doors, central island, wood burning stove and feature reclaimed wood breakfast bar, 3 double bedrooms, a luxury bathroom, with both bath and walk in "rain" shower, a "nook" and a utility room and cloakroom. Externally the property enjoys grounds which extend to approximately 1/2 acre laid in lawns, paved and decked patio, planted beds, mature trees and shrubs, generous gravel parking area and detached workshop. 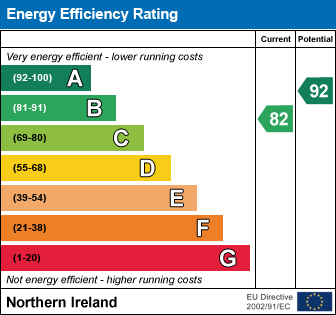 In terms of energy it benefits from uPVC triple glazing, under floor heating to all the tiled floor areas, oil fired boiler, wood burning stove, external wall insulation and extensive solar electric system which should guarantee low energy bills. The beautiful Cloughey beach is close by as are a number of shops and restaurants whilst Newtownards is approximately 16 miles to the north so still within reach for commuting or schools, etc. This is a unique home which simply must be seen to be fully appreciated and is sure to give the eventual new owner years of pleasure. Storage cupboard and roofspace access. Double panel radiator. Range of high and low level units with wood worktops. "Leisure" Range cooker and extractor fan. Tiled floor. Wood burner stove with back boiler. T.V point. Patio doors to decking area. Stainless steel sink and mixer taps. Plumbed for washing machine. Double panel radiator and tiled floor. Wash hand basin and WC. Tiled floor and single panel radiator. Extractor fan. Wood flooring. Double panel radiator and T.V point. At widest points. Wood effect laminate flooring. Double panel radiator. Wood effect laminate flooring and double panel radaitor. Modern white suite comprising stand alone bath, rain shower and floating wash hand basin. Wood effect tiled flooring. Heated towel rail. Recessed spotlights. Pebbled drive with parking to side. Large enclosed lawned garden to front with decking area. uPVC fascias throughout. Boiler and oil tank located to rear of property. Travelling out of Cloughey towards Portaferry past Watson's Stores and filling station, 63 Portaferry Road is located approximately 1/2 mile on the right at the bend. I am interested in 63 Portaferry Road, Cloughey. Please contact me about this property.